This post contains affiliate links. These links don’t change the cost of the product however we do receive a small percentage which we use to keep the blog running and buzzing with new content. Hey friends! Can you believe summer is quickly coming to an end? 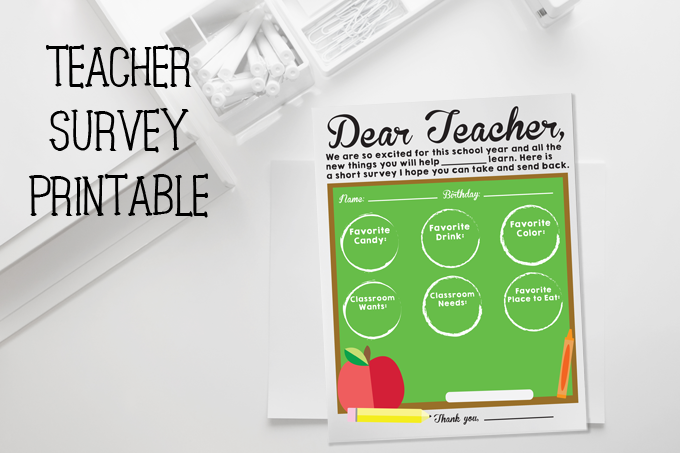 I am sharing a really great teacher survey printable I made last year. I shared it over on See Vanessa Craft and it was wildly popular so I can’t wait to share it again here. 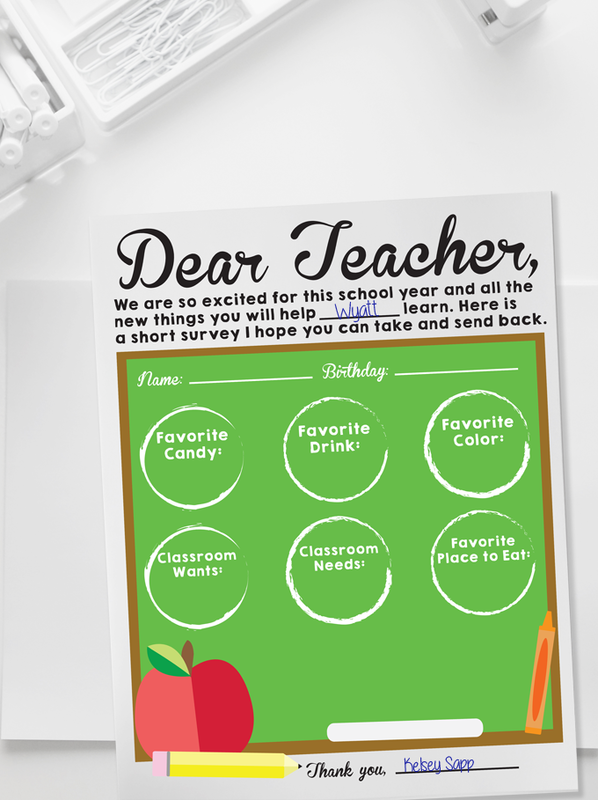 We sent these to my boys’ teachers on the first day of school and it helped so much when I wanted to send them little gifts, Christmas gifts and Teacher Appreciation items. When I sent in items I knew I was sending them things they needed, wanted or would definitely use. As a parent who stayed at home for over three years I know teachers have their hands full! My kids often spend more time with their teachers than they do with me now that I’m make at a full time job and therefore I want to show my appreciation. Something as simple as their favorite drink and candy can brighten a rough day! The survey has two spots to fill in with your child’s name and your name. 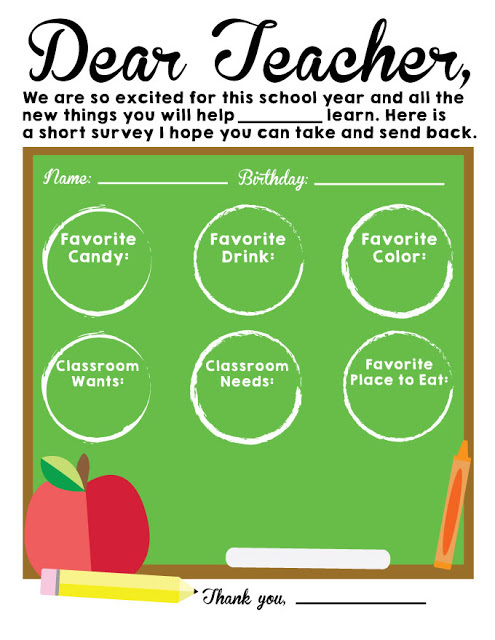 There are six spots for your child’s teacher to fill out that ask their favorite color, drink, candy and place to eat as well as classroom wants and needs. Since I am a bit of a craft supply hoarder I have found that I usually have a few supplies that teachers need or want already around the house. By having this list I can also keep classroom needs and wants on my radar if I see them on sale! To grab the printable click on the image below or find it HERE. I have mine all printed and ready to go along with a few papers that have to be sent in on the first day of school. We start back on August 15th and I am stressing. Over the summer I returned to a full time job so we have been searching for daycares, arranging after school pickup and on top of that our boys are going to a new school this year since our oldest has been placed in gifted classes. I am a ball of craziness! How did I ever work full time with kids before!? If you are like I used to be then you might be thinking great but I’m out of ink! In October of 2015 I got an HP printer and signed up for HP Instant Ink. I pay $2.99 per month, my printer orders the ink and then it shows up at my door so I never even have to think about it. I print all my printables on white cardstock using my HP printer with HP Instant Ink. Sign up using my code INSTANT3 and get the first 3 months free! While you are at it stop paying a kajillion dollars for white cardstock – they sell 150 sheets of Georgia Pacific brand 110lb cardstock for $5.49 at Walmart! Don’t say I never helped you save a few dollars.